One constantly comes across new information on the diversity of our ancestry as South Africans. Many of the stories are quite intriguing and may well impact positively on the way we think and act today, if we can only develop a national app…reciation of this information. In this regard it is vital that simple story versions of heritage importance are provided to the broad public as this commonwealth of knowledge belongs to the people, historically denied a proper exploration of their past. Herein newspapers, radio, television and the internet have a major duty to discharge instead of serving up cheap b-rate US junk. In recent years the likes of Webster, Max du Preez and others from the journalist ranks have brought out articles and anthologies in story-telling tradition, unencumbered by the rigidity of academic protocols so that the public can share what too often remains cloistered from public gaze. In so doing they have rendered the public a great service. This and the valuable work of heritage activists in no way seeks to compete with academia which has its own role to play; indeed it compliments academic research through applied history and heritage activity that is accessible to Joe Public. Around the end of 2001 when going through a stockpile of photographs on slavery at the Cape at the National Library I came across two photos of child slaves in Victorian dress and this puzzled me. On the back was a sticker which simply said that the subjects in the photographs were the Galla slaves at a mission school in the Eastern Cape. When in doubt one goes to ones elders, so I consulted with Professor Dicky van Der Ross who was able to fill me in on a few aspects of these Galla slaves. I then did a bit more research and came across more remarkable pictures on the internet and enough other information to put together just the basic storyline of what turned out to be the Oromo slaves who came to South Africa from Abyssinia via Aden in 1890. In posting the brief piece on the Oromo on the Cape Slavery Heritage blogsite there was a call for researchers to seriously tackle this intriguing tale in more depth. A decade later much valuable research has been published by Dr Robert Shell and Sandra Shell. My colleague and I at that time had also paid the National Library for the digital copies of the photographs with permission to use them and we displayed them in frames with a brief on the story at the heritage lounge of the Inyathelo Institute which I co-founded. Because we worked with many academic institutions across Africa and with black entrepreneurs in tourism there was much interest in this African story. The photographs elicited many questions from interested people and thus a conversation was started about the Oromo and more broadly about children and slavery, as the vast majority of slaves were indeed children, (and with slavery today, this remains true). This also led to a seminar under the auspices of the Early Childhood Development sector on Generationally Transmiitted Trauma in Communities, which looked at slavery on the one hand and genocide of San and Khoena communities on the other – and how these impacted on contemporary life. The story of the Oromo also briefly featured in my educational exhibition in the Slave Lodge museum -The Ties that Bind Us – aimed at exposing to broader publics the many hidden stories of our heritage. By bringing out a hidden aspect of our heritage we were able to look at a range of contemporary issues with different eyes. Most people had not heard of the Oromo prize slaves who had come to South Africa long after the ending of slavery. The story though around in exclusive circles for many years came into greater prominence when the late former freedom fighter and political prisoner Dr Neville Alexander publically also shared his own family roots in the Lovedale Oromo. In an era where we combat xenophobia it is important to explain what I call ‘the COUSIN FACTOR’ in our national make-up whereby most who call ourselves South African regardless of what national group, may be surprised that they are related to the very people they call the OTHER. This is the power of these hidden histories and why they should not be camouflage, locked away cloistered for just the few. The story of the Oromo slaves from Abyssinia who were given refuge at the Lovedale Mission in the Eastern Cape draws away another curtain on our genetic and cultural make-up in South Africa. Dubbed the ‘Galla’ slaves, the Oromo did not like this term drawn from the Galla River in Guraque. The term was associated with brigand groups of mixed African and Semitic people and distorted the Oromo story. In 1888 the British Royal Navy ship the Osprey patrolling the East African coast confiscated the slave cargo of an Arab slaver dhow from Abyssinia. The slaves on board were in terrible shape. In that mission the Royal Navy captured 33 slave traders and 213 victims were found. They were from Oromoland near Abyssinia. Only 4 were grown men while the rest were women and children. Due to the cramped conditions many could not walk unaided and were carried on board the Osprey which transported them to the navy based in Aden. With an outbreak of illness in Aden more than 40 of the prise slaves died. But Aden kept getting more and more of these seized ‘cargoes’ of slaves so the British began sending the children in particular to its colonial territories – South Africa being one of these. Some also were sent to England and Wales. Oromo indeed found themselves spread all over the world. Some of the adults became seamen in the Royal Navy too. There were 22 girls and 42 boys who were sent to East London on the ship Conway Castle. 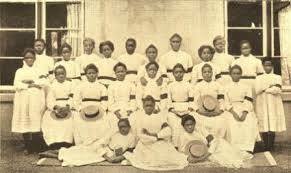 They arrived on 20 August 1890 and were all under 18 years old – most being under 10 years of age. By 1900 of these 13 had died largely as a result of what c commenters described as the ‘the unspeakable misery of their early lives’. The Lovedale Magazine is said to have published the brief biographies of the 51 survivors. Most of the girls went on to become domestic servants and most of the boys, tradesmen. The Oromo story and the lives of the descendants of the Oromo offer us a unique and resource-rich window for sociological and heritage study in the realm of slavery related heritage in South Africa. In recent years Dr Robert Shell and Sandra Shell have painstakingly conducted the in-depth and ground-breaking study on the Lovedale Oromo, the background and postscripts of their story…. It was a story that just cried out to be told and this was a major heritage feat for which they must be congratulated. A simple story version needs to still hit the streets and again here there are clearly movies and plays to be made. This is the way to bring heritage to life for most people. For those who are interested in pursuing more on this story the resources are now there to tell the more elaborate story than this potted pen version of mine. Many, many more of these stories are also just waiting to be discovered and be told. Like Neville Alexander you have these stories in your families and you could be the storyteller. Some of the Oromo opted to be repatriated when given a chance to later do so, but others remained in South Africa Herein also lies a sub-story. …. Their lineages incorporated ‘coloured’, amaXhosa, baTswana and baSotho. They became part of our genetic and cultural heritage. What is also most interesting is that because photography was emerging in this era, the Oromo and the slave ship conditions were photographically recorded. This gives us a good picture of what earlier conditions of slave transportation on the high seas may have been like. In this sense the Oromo story can also act as a key or window linking past to present. Understanding the Oromo story has great significance for today as migrations of all sorts, including modern slaves, continue to come to South Africa. History and heritage stories are being made even as I write here today.